My fondest memories from college involve my time at the student newspaper. (Which has twice been named the best college newspaper in the U.S. by The Princeton Review.) Despite the fact that I was just a lowly entertainment editor, I loved my time there and I learned so much. I was able to observe first-hand how hard reporters worked to get their stories and the amount of research and dedication involved. (Meanwhile, I wrote essays on Italian horror movies.) As the internet has taken over daily life, newspapers can seem irrelevant at times. However, even if you are reading a "paper" on a website, there are still reporters hard at work at these institutions. 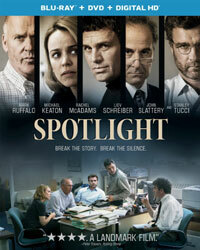 We get a good look behind the scenes into this world in Spotlight. The year is 2001 and the setting is The Boston Globe. "Spotlight" is a special section of the newspaper which focuses on investigating high-profile stories, often taking months to complete an assignment. Overseen by Robby Robinson (Michael Keaton), the team consists of Mike Rezendes (Mark Ruffalo), Sacha Pfeiffer (Rachel McAdams), and Matt Caroll (Brian d'Arcy James). New Editor-in-Chief Marty Baron (Liev Schreiber) has noticed a small article concerning a priest accused of sexual abuse. He suggests that the "Spotlight" team drop what they are working on and look into this. As Mike attempts to get information from Mitchell Garabedian (Stanley Tucci), an attorney who has worked with alleged victims of this abuse, Robby calls in some favors with local officials. As data is gathered and members of a victims group are interviewed, the team begin to realize that this small issue is much larger than imagined, as many priests were involved and there is an indication that the church worked to cover thing up. The sexual abuse scandal in the Catholic Church made national headlines, but I don't think many realize where the story originated. Spotlight does a fantastic job of illustrating how all of this came about. The film is very methodical in its recounting of the story, starting with the relative skepticism of the "Spotlight" team -- they aren't happy that they are asked to abandon a story into which they had invested a lot of time -- and building as more and more information is gathered. The movie doesn't take place in real time -- the team is forced to focus their attention elsewhere following the events of September 11, 2001 -- but we do follow the team on their step-by-step journey. Each member uses their particular expertise to get information and we see how seemingly disconnected things begin to come together. Obviously, Spotlight is a narrative film which tells the story of something which happened in real life. I can't help but wonder if someone considered making a documentary about this topic, as Spotlight skews very close to being one. As noted above, the movie is very meticulous in exploring how the team put their story together. However, there are certainly times when the movie focuses too much on this task and ignores other important components which comprise a complete movie. The most obvious issue is the lack of character development. We learn key components of each person -- Mike is tenacious, Robby is good at playing the game, Matt is very detail-oriented -- but they never become fully-formed people. We learn that Mike is having marital problems, but this is never fully explained. In a similar sense, the beginning of the film feels very rushed, as if it couldn't wait to get to the meat of the story, as there is almost a feeling that we are supposed to be familiar with some of the backstory here. As with many docudramas, it's hard to lay any firm criticisms on Spotlight. It has chosen a very interesting subject and it does a good job of walking us through that topic. And unlike many other movies in this vein, the detail here helped to cut down on the "Did this really happen?" moments. I can truly say that I learned about the scandal here. But, I can also say that I didn't feel much. Spotlight presents a very touchy and heavy subject, but in some ways it shies away from the truly graphic nature of what happened and we don't feel the sense of outrage which we should. The movie does get a definite boost from the acting. Ruffalo turns in an incredibly powerful performance, most notably in the scene where he stands up for his feelings on the story. Spotlight is certainly worth seeing, as it will truly take you inside of the story, but don't expect to be blown away by it. Spotlight never explains how that guy landed Rachel McAdams on Blu-ray Disc courtesy of Universal Studios Home Entertainment. The film has been letterboxed at 1.85:1 and the Disc contains an AVC 1080p HD transfer which runs at an average of 32 Mbps. The image is very sharp and clear, showing no noteworthy grain and no defects from the source materials. The colors look fine, although we don't get many bold tones here, and the image is never overly dark or bright. The level of detail is impressive and the depth works well for this kind of film. The Disc carries a DTS-HD Master Audio 5.1 track which runs at 48 kHz and an average of 4.0 Mbps. The track provides clear dialogue and sound effects. The newsroom scenes provide ample opportunities for stereo and surround sound effects which highlight minute sounds coming from off-screen. We get a similar effect when Mike visits the courthouse. Otherwise, the bulk of the audio comes from the center channel. The Spotlight Blu-ray Disc contains only three extra features. "Uncovering the Truth: A Spotlight Team Roundtable" (7 minutes) is a discussion amongst six of the real-life figures from the story who give us a quick overview of what really happened. While this piece is short, it is refreshing to see the actual people telling their story. "Spotlight: A Look Inside" (3 minutes) is simply a brief EPK which offers clips from the movie, some quick on-set shots, and comments from the cast and Writer/Director Tom McCarthy. "The State of Journalism" (3 minutes) is another short segment in which those involved in the film talk about how unique the "Spotlight" team is and how important it is that journalist be able to uncover the truth.